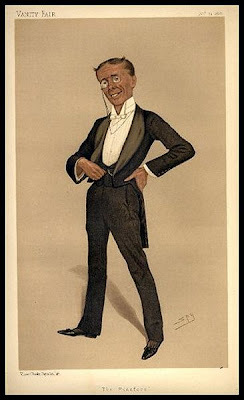 George Grossmith and Weedon Grossmith. 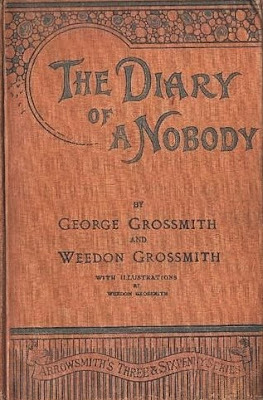 THE DIARY OF A NOBODY. J.W. Arrowsmith, Bristol, and Simpkin, Marshall, Hamilton, Kent and Co. Limited, London. 1892. An English comic novel written by George Grossmith and his brother Weedon Grossmith with illustrations by Weedon, it first appeared in the magazine Punch in 1888 – 89, and came out in book form in 1892. The diary is that of Mr. Charles Pooter, a city clerk of lower middle-class status but significant social aspirations, living in Upper Holloway. Other characters include his wife Carrie (Caroline), his raffish and slangy son Lupin, his friends Mr Cummings and Mr Gowing (jokes about coming and going), and Lupin's unsuitable fiancée, Daisy Mutlar. The humour derives from Pooter's unconscious gaffes, his suburban social pretensions and self-importance, also the many snubs he receives from those he considers socially inferior, such as tradesmen. Pathos (and bathos) is mixed in with the humour--e.g. when Pooter attends the Mansion House Ball (the highest point of his social ambitions) he is distressed to find his name omitted from a long list of guests published in the "society" column of the Blackfriars Bi-weekly News. A letter of complaint results in him and his wife being listed as Mr. and Mrs. Potter, which further enrages him, leading to a correction in the paper which then lists him as Mr. Pewter. VALUE? Not especially high but more that 'Three Men in a Boat' which was also published by Arrowsmith three years earlier (you want the address as 'Quay Street' not '11 Quay Street'). Very decent copies should not cost more than £300, Adrian Harrington currently has a decent copy with a signed photo of Weedon Grossmith for £475. It might be more if it was George Grossmith (left) - famous in his day for performing his own comic piano sketches and songs and creating a series of memorable characters in the comic operas of Gilbert and Sullivan; it is said he was the most popular British solo performer of the 1890s. Julie Burchill nominating 'Diary' as her favourite book notes that he also found the time to dally with morphine, possibly as a way of dealing with stage-fright. Browsing this masterpiece the other day it occurred to me that blogs, with a few exceptions, are basically 'diaries of nobodies' and the struggle of man with his insignificance as the Grossmith freres discovered is both a comic and a tragic matter. John Fowles in 'The Aristos' talks of this struggle (with what he calls 'the nemo') as the supreme source of anguish and suggests the ways of challenging the 'nemo' used by modern man--'I build up a unique persona, I defy the mass. I am the bohemian, the dandy, the outsider, the hippy...' Portentously he adds '...Oswald killed President Kennedy in order to kill his real enemy: his nemo.' I guess if he was still around he would say that people who go on reality TV shows are confronting their nemos… Will deal with this strange work 'The Aristos' (Cape 1964) at some point--its value as a first is not insignificant. Does anyone know anything about Weedon Grossmith's novel, The Woman With a History? I've been looking for it for years. I don't think "The big point that JW makes is that if you don't find it funny 'it almost certainly means that you're self-deluded and humourless enough to be considered Pooterish.'" is quite right. Two people I knew- one a raving Marxist, one a very distinguished translator- thought it tragic. According to George Orwell, the Diary had been popular in prerevolutionary Russia. He thought in translation it probably read like Chekhov, so perhaps they both ha unEnglish perspectives on it. Ach we'll start worrying when you paint your bath red Nigel. I couldn't make head nor tail of the Aristos, which I discovered at the same time as the Kingsley Amis poem on Verne's Captain Nemo - the poem became an immediate favourite but the Fowles book thankfully has faded from memory. That never occurred to me Thersites - and of course it's often pointed out that Americans and Brits tend to see the tragic rather than the comic in Chekhov. I wonder if Lupin & his wife ended up in some outback Aussie town, gazing wistfully at the desert and remembering mum and dad while the dingos howl. However Lupin ended up, I'm sure Charles and Carrie's boy has no resemblance to the Lupin Pooter who used to appear as 'Victorian Dad' in Viz! I do have a fantastic penguin edition of "The Diary of a Nobody" with spectacular artwork on the from cover; which I am selling for just £10 plus £2.99 p.p. It was published in 1975. Melanie - please email me - the CEO of this blog, about this interesting first edition.